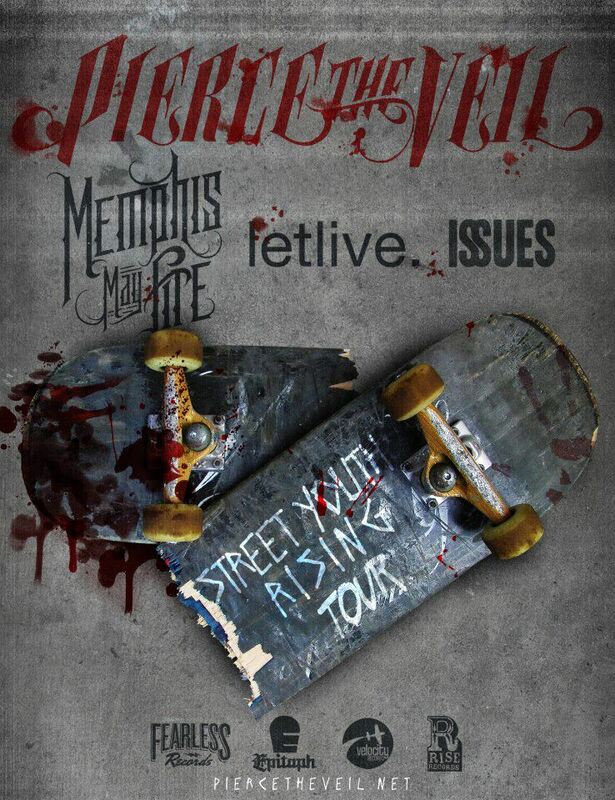 Pierce The Veil has announced a massive tour with their friends Memphis May Fire, letlive. and Issues. The Street Youth Rising Tour begins in March, and will feature Pierce The Veil supporting their latest release, Collide With The Sky. Pre-sale and VIP Tickets are available here at this link, and the full routing can be seen after the jump, along with a message from front man, Vic Fuentes. If you choose to order the VIP pre-sale, a Meet and Greet limited bag, limited edition poster and a Rockstar lanyard will be included. In addition to this tour announcement, Pierce The Veil and Invisible Children are giving away exclusive merchandise items as part of the “12 Days of Fearless” holiday contest via Instagram. To enter, follow @FearlessRecords on Instagram to win great prizes from Pierce The Veil and Invisible Children.